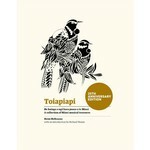 First released in 1991, Toiapiapi astonished the musical world of Aotearoa. Never before had such a range of taonga puoro (customary musical instruments) been heard, alone or together, in recorded music. It signaled the arrival of new ways of making music here. Toiapiapi combined poetry and musical performance. It joined the voice of reo Māori with the voices of nature, the sounds of customary Māori musical instruments with those of modern acoustic and electronic ones. Now, 25 years later, when taonga puoro have again become a natural part of the musical scene in Aotearoa, we celebrate that pioneering recording in a CD compilation with this new edition of the original Toiapiapi publication. It is also a tribute to the legacy of Hirini Melbourne (1949-2003), poet, musician, composer, scholar, and advocate for Māori language and culture and the creative arts.